Samurai Champloo is a twenty-six episode anime revolving around the social group of erratic swordsman Mugen, calm and collected samurai Jin, and the playful and the naive female Fuu (with a pet squirrel named Momo). The group find themselves teaming up on a quest for the "samurai who smells of sunflowers." Jin and Mugen decide to aid Fuu in finding this person, later revealed to be Fuu's father as well as a Christian (which would be a heretical belief in Japan during the era which this series takes place). However, the original agreement includes that after finding this samurai for Fuu, that Jin and Mugen will finally battle to the death. When this eventually does occur, the two warriors are spent and exhausted, with their blades shattering and their bodies collapsing in an almost yin-yang formation. Mugen's fighting style is mad, manic, and heavily improvised. Not only does it involve sword strikes with a single blade, but he also tends to employ break-dance style maneuvers, letting him kick heads with his thick and durable wooden sandals. His name means "infinite" in Japanese. Jin's fighting style is more of a traditional focused method, relying on nothing more than precise sword strikes from a pair of blades with the occasional feint. His name means "benevolence" in Japanese. Fuu doesn't really have a fighting style, yet her wits and the occasional access to explosives ensures that she's far from helpless. Her name is a shortened version of the Japanese name for a type of bird, fuukinchou. The series contains several noteworthy and awesome episodes. These include battles between two sons of a martial arts master who battle with graffiti instead of martial arts, an eating competition, an episode focusing on Mugen overcoming his illiteracy of even basic kanji (initially he only knows the character "No," which means "and" in Japanese), a baseball match against the American Black Ships that gets downright violent, and even an impressive battle with some rebelling warrior monks against the background of a burning marijuana field. The music and soundtrack of the series is heavily influenced by hip hop and rap, obviously spoken by Japanese singers. However, the opening theme "Battlecry" has an excellent grasp of how English should sound and is quite enjoyable. Mugen fights the three brothers and Jin tries to survive his fight against the Edo assassin. Fuu leaves Mugen and Jin to follow a lead on the Sunflower Samurai. Meanwhile Jin and Mugen face of against the unstoppable assassin from Edo. The team takes a minute to reflect on all that has happened and Fuu questions her own value. Unknown to the team a top assassin from Edo is coming for them. Fleeing a dinner bill, Mugen is knocked down by a baseball tossed by a man. Mugen's return throw convinces the man to enlist him, along with Fuu and Jin, in a baseball game to preserve the honour of Japan against the Americans, who are trying to open the island nation up to the West. Jin, Fuu, and Mugen literally fall into an excavation site. The leader of this site, according to his family tree, is hundreds of year old and the men working the site don't seem capable of dying. Sara makes a request of Fuu: She asks if either Mugen or Jin can accompany her to see her son. With a heavy heart, Fuu selects Jin to go with her. On the way, Sara reveals who she truly is to Jin and attacks him. One day at a bar the trio meets a blind woman named Sara. She follows the group on their travels, but Jin senses there is something hidden in the grace of her movements. Fuu helps a woman being pursed because of her Christian faith. Meanwhile Jin and Mugen meet a man claiming to be the grandson of Japanese Christian hero Francisco Xavier. Taggers are making a mess of the city. Jin and Fuu learn that Mugen can't read, much to his embarrassment. Jin visits an old d?j? where he used to train and helps to solve a dispute between the twin sons of his old master. While fishing. Jin finds a bag of gold coins, which means for our impoverished group a much needed blessing. However, it's soon discovered that these coins aren't what they claim to be, nor is the prostitute that takes a strange interest in them. With the boat heist in full swing, Mugen has decided to temporarily trust his old crew. To add to his uncharacteristic move are renewed feelings for the sister of the man who betrayed him and their is still no reason to believe he won't betray Mugen again. In order to save Fuu, Mugen and Jin face the most dangerous moment in their journey. How would they escape from this danger? Would Fuu be able to meet the Sunflower Samurai? And what would be the outcome of Mugen and Jin's fight? Sara told Fuu that she wants Mugen or Jin to accompany her on her journey. Fuu worries over this, but ends up asking Jin to travel with Sara and they set out on their journey. The two have yet to realize that this is the beginning of a sad, brutal fight. Fuu waits for the others in a shack, when a woman named Yuri runs in saying she is being chased because she is a Christian. Fuu hides Yuri, but the pursuers find and abduct her. Mugen and the other two decide to go their separate ways. Swiftly, an arrow comes flying at Mugen. At that same time, Jin fights an assassin, and Fuu falls into a river and gets rescued by a master of bow and arrow. Mugen and the other two end up at the ocean, where Mugen bumps into a girl who happened to be a childhood friend of his named Koza. Additionally, a man Mugen knew appears upon that scene named Mukuro, who is now a leader of a gang of pirates. JIn meets a woman whom he believe's is about to commit suicide and follows her to her small resturant. Upon further discovery he finds out she is really a prostitue forced into that profession through no fault of her own. Now Jin must decide if he we help this strange woman he is oddly taken with. A man has been killing the strongest samurai around without leaving a mark on their bodies. After Mugen has a run-in with this man and barely escapes with his life. It's decided that he and the rest of the gang need a place to re-coop but it's soon discovered that their sanctuary is more than that. As the seemingly benign monk in charge shows more skills than prayer and temple duties. After the gang is arrested at a check point for passing fake papers, the only way out is to deliver the head of a man executed earlier that day by the crazed checkpoint commander to the town where the man was wanted. The commander assigns Mugen to deliver the package while he holds Jin and Fuu as collateral. Starving, the trio find themselves in front of a pawn shop where they are able to sell Jin's glasses for some fast cash. While spending their money on food, Fuu is approached by a man who is enchanted by her. At the same time, Mugen is seduced by a pretty woman. Later, Fuu meets with the man and is told that he is searching for a samurai who killed his master. Coincidentally, this man wears glasses and is named Jin. In order to feed themselves and make a profit at the same time, the trio enter an eating contest. Sacrificing their prized possessions as the entrance fee, which they will be able to retrieve should they win, Fuu, Mugen, and Jin all try to eat as much as they can. However, one contestant seems to have an advantage. The trio try to hitch a ride on a ferry, but the fee is too steep for them. Splitting up, they each search for some quick cash using the only skills they have. Jin and Mugen face off as the top fighters of opposing Yakuza gangs. Meanwhile Fuu is trying to find a way out of the Brothel with an innocent girl who was sold to pay a gambling debt. All the while fate's hand is at play as the strange words of a fortune teller slowly come to pass. Continuing to remind them of their promise to her, Fuu is taken aback when Mugen and Jin decide to ditch her. Both samurai take separate paths, but enter the same town and meet up with rival clans who have been warring over territory. At the same time, Fuu enters the town and receives a warning from a gypsy. One of Mugen's recent victims has vowed revenge and used his power to have a beast of a man released from prison. Meanwhile, the newly formed trio of Mugen, Jin and Fuu try to find a bite to eat on the little cash they have. During a stay in Edo, Jin runs afoul of the local governor and Mugen, who walks into the restaurant where Fuu works, makes a deal with the girl to take care of some rowdies at the restaurant in exchange for some free food. One of the miscreants who Mugen faces is the governor's son, and once the governor hears of this, he dispatches all the men he has to capture Mugen and Jin. Samurai Champloo is currently available to watch free on Crunchyroll, Crackle and stream on Cartoon Network. 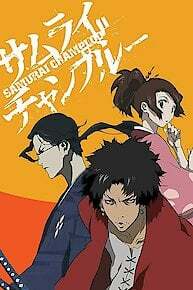 You can also stream, download, buy, rent Samurai Champloo on demand at Amazon, Hulu, Google Play, iTunes online.